Leia Organa isn’t the type of princess to sit in a castle while twiddling her thumbs. She’s proven her mettle more times than we can count during the original Star Wars trilogy. When she sees a tyrannical regime doing cruel and despicable things, she just has to stand up to them! When the Galactic Empire starts building a flying death machine to enforce the galaxy through fear and violence, then she finds a way to blow it up. When a Stormtrooper gets in her way, she’ll grab a blaster and get shooting! When Han Solo says something preposterous, she’ll let him know how she feels about it. And if a generator shield needs blowing up, she’ll roll up her sleeves and get to work. Yes, Leia shows more heroism each time we see her in the Star Wars films, so she makes a great choice for roleplay if you plan on dressing up like a character from a galaxy far, far away. It can be hard to get that classic look, but this Princess Leia costume comes with everything you need to cultivate the perfect look. 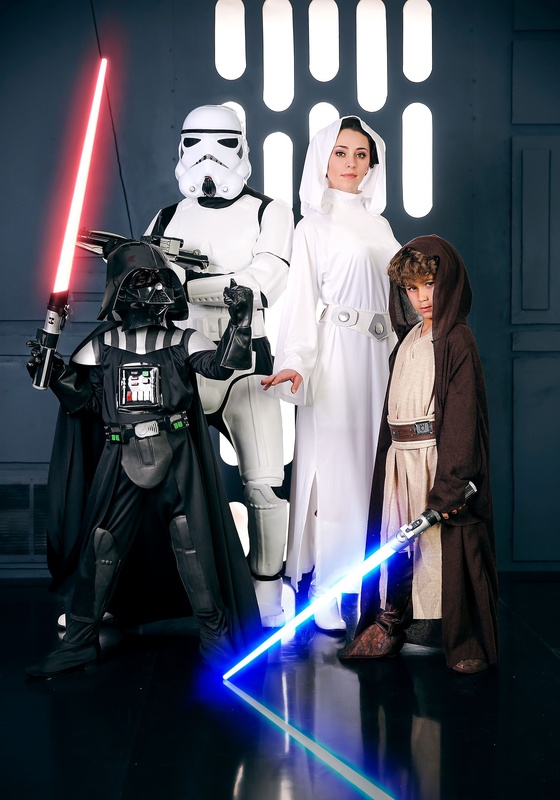 Based on her original appearance in A New Hope, this Princess Leia costume is a deluxe outfit that comes with a white dress that has a sparkling accents and an attached hood. It also comes with a belt that looks like the one worn by Carrie Fisher in the film. It even comes with the bun wig, so you can get that hairstyle that’s popular on Alderaan without a stop to the salon!